American TeleMedicine: Guest Blog: Measuring Telehealth: Finding the right Measure or Asking the Wrong Question? A paradigm shift is slowly occurring in the healthcare field, moving from incentivizing the volume of services delivered to rewarding value-based care for patients.1 With the significant shortage of healthcare providers, our nation’s profound demographic shift (i.e., growing senior population) and the increasing number of doctors retiring from practice, transitioning to value-based care is becoming, if not already, one of the most pressing issues in healthcare today.2 Given these circumstances, alternative delivery models are being explored to more effectively utilize a shrinking supply of providers, while addressing the growing healthcare demands of our nation. One such delivery model is telehealth, which broadly defined, refers to the use of information technology and telecommunications to share information and provide training and clinical services from a distance. Although the potential for telehealth has been touted for years, adoption remains limited, with one of the most likely reasons being lack of reimbursement. While there are several factors for limited reimbursement, inconsistent measurement and mixed results regarding the effectiveness of telehealth certainly haven’t helped. What does the data tell us today? While there is a vast body of literature addressing the impact of telehealth, it is equally varied. Notably, a recent review of telehealth’s impact conducted by the Agency for Healthcare Research and Quality (AHRQ) reported mixed results after evaluating thousands of telehealth studies. However, the most robust evidence to show telehealth as generally clinically effective points towards its use in chronic condition management, remote patient monitoring, and delivering behavioral healthcare.3 Outside of these areas, there still remains an insufficient evidence base. While the volume of research is growing, so does the variability in how outcomes are measured, preventing firm conclusions as to where telehealth is most clinically and cost effective. 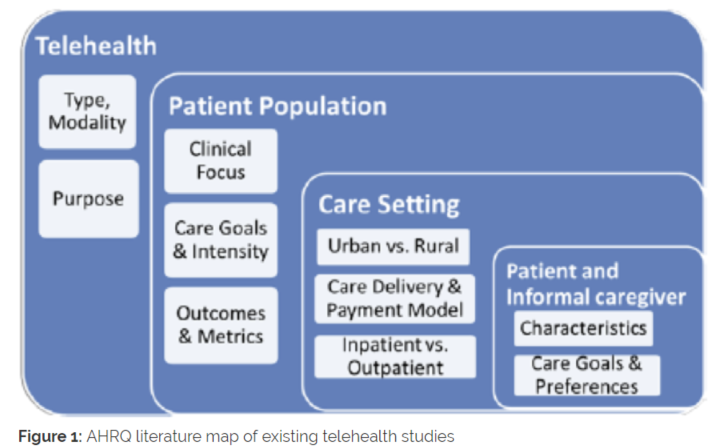 For example, the literature focuses largely on specific clinical use cases of telehealth, outcomes which are captured inconsistently across institutions, or characteristics of the delivery model itself (e.g. modality), all of which are likely to vary and yield different results (see Figure 1. ).